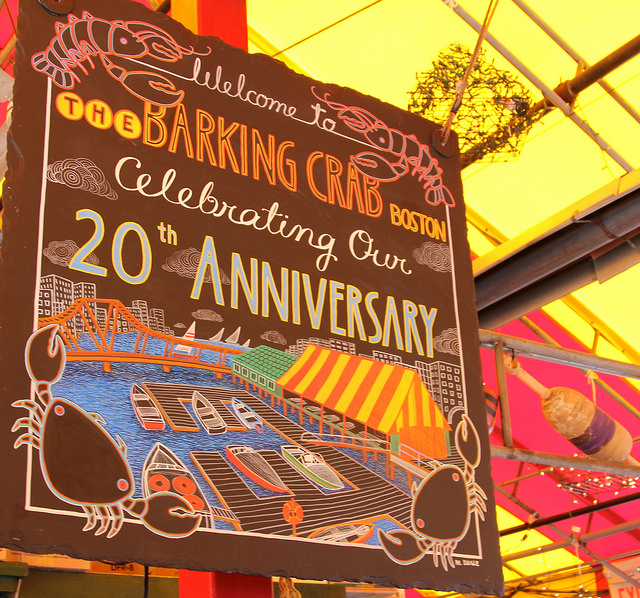 Located on the edge of Boston’s historic Fort Point Channel, The Barking Crab has become one of the city’s best-loved meeting and eating spots. 2014 marks our twentieth year of operation. Opened in May of 1994 as an outdoor summer restaurant, we were known for our first three years as Venus — Seafood in the Rough. After a successful second season, the restaurant expanded into the adjoining Neptune Lobster and Seafood Market, adding a wood-burning stove and becoming a year-round operation. Not the “typical” Boston seafood restaurant, The Barking Crab offers the casual atmosphere of a coastal clam shack in a funky urban setting, with a marina alongside for easy access by water, and all the exciting resources of Boston only a short walk away. Our menu concentrates on fresh seafood and offers our local take on the urban New England Clam Shack. Our wait and bar staff are cool, friendly and knowledgeable. And we can accommodate you whether you’re dining alone or arriving with two dozen of your closest friends. Come join the fun!